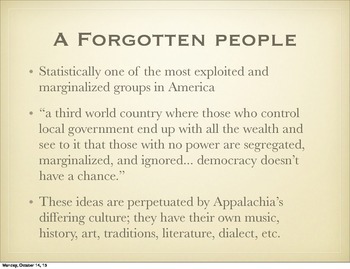 This twelve-slide PowerPoint discusses the evolution of Appalachia as a mining area and all the stereotypes that accompany the people who live in that region. 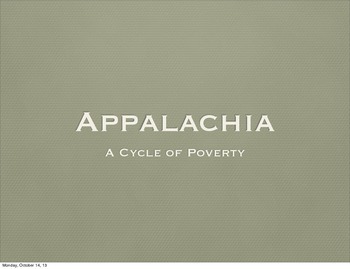 This presentation shows how poverty is sometimes unavoidable because of the situations in which people live and the exploitation they are subject to by the large companies that monopolize their towns. 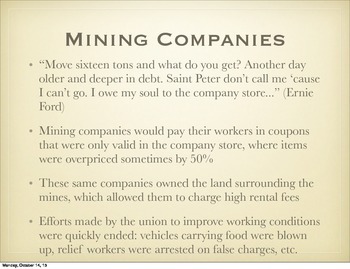 I use this PowerPoint as I teach “Life in the Iron Mills,” by Rebecca Harding Davis, with the hopes that students will understand how it is possible for people to be trapped within their current socioeconomic situation. While reading “Life in the Iron Mills,” students sometimes wonder why the main characters, Hugh and Deborah, didn’t just leave Wheeling in search for a better life. This PowerPoint helps students understand that sometimes, fleeing a horrible situation isn’t always possible. 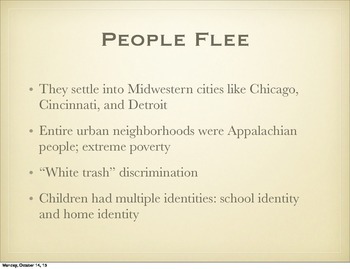 I also use this PowerPoint to refresh my students’ memories and introduce the phenomenal 20/20 documentary by Dianne Sawyer, A Hidden America: Children of the Mountains, which tells the heartbreaking stories of people who currently live in Appalachia. This documentary can be found in five parts on YouTube.com and lasts just short of an hour. Looking for more material for Life in the Iron Mills? Check out the link below! Media Literacy: Life in the Iron Mills Complete Unit.